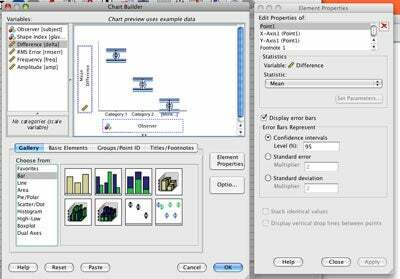 SPSS is a longtime player in the statistical/scientific software realm. Originally targeted at the social sciences, this statistical software package has evolved to support analysis and decision making in broader disciplines and business. I have some semi-vivid memories of my first encounter with SPSS in 1982—punch cards, JCL, /SYSIN = DD, and haggard grad students smoking up a gray cloud outside the room with the IBM 360, staring at a little black and white TV monitor in hopes that our job would finish next. Over the years, SPSS has migrated from its birthplace on the mainframe to the desktop with an occasional bump in the road, most notably when it came to the Macintosh. As the Mac platform evolved to incorporate the PowerPC chip, Mac OS X, and, recently, Intel processors, SPSS has consistently lagged behind its Windows counterpart in features and support. With the release of version 16, SPSS has made changes to the product that should ensure smoother transitions in the future and, even better, keep the Mac version in sync with the program’s Windows and Linux versions. These changes are primarily due to the complete re-implementation of the user interface in Java. The core statistical calculations are still done using platform-specific compiled code, ensuring efficient computation. In fact, several procedures have been optimized for multithreading on modern multicore processors, including the regression, correlation, and factor analysis modules. Educators, especially those who teach in multiplatform environments, will be happy with the consistency across the product line. However, this consistency comes at the cost of aesthetics—the application has a clear Java look and feel. Things aren’t as bad as they could be in this department, since Apple is responsible for the Java implementation in Mac OS X. Thus, users won’t be totally unfamiliar with the interface, but it does lack the polish of most Apple software. The Web browser-based help system also feels a little bit clunky. It is very complete but suffers from a lack of organization that might daunt novice users. Materials on common subjects are spread throughout tutorials and references, with only sparse cross- referencing. Among my colleagues, one frequently heard plaint is that desktop versions of the major statistical packages can’t deal with the massive data sets that their mainframe parents can handle. To put both SPSS’s statistical engine and its user interface to the test, I created a 5 million-row, 10-variable data file to import and analyze. Using a MacBook Pro, I was able to compute a multi-factor ANOVA on this massive data set in just under 10 seconds. The data editor didn’t hiccup—a testament to the strength of the program’s Java implementation—so I was able to easily browse and edit all 5 million rows. The Data Editor and other user interface items have been revised using Java. The program maintains the traditional SPSS layout, but it isn’t quite as aesthetically pleasing as most native Mac programs. Before the advent of the graphical user interface, statistical program users were forced to script their computations using the notoriously awkward SPSS syntax. While you can still do this, version 16 adds the ability to control SPSS via the Python language. No doubt the choice of this particular language arises from its acceptance and enhancement by the scientific community (as demonstrated by the development of SciPy and NumPy, for example). 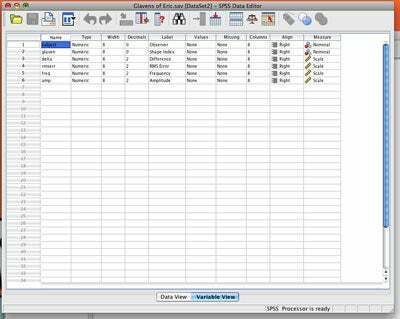 Most importantly, this programmability allows SPSS to access methods from the widely used R statistical package. That is in addition to a neural network add-on module and partial least-squares regression, new analysis features making their debut in version 16. Also new on the Mac platform is the Chart Builder feature. Anyone who has struggled with dialog boxes full of graphing options will welcome the ability to perform direct WYSIWYG editing on the visual depictions of their data. With version 16, SPSS has leveled the playing field across all platforms, and the program’s Java implementation should allow the Macintosh version to keep up in the future, rather than lagging as it has in the past. It is a significant upgrade that will be warmly welcomed by Macintosh data-mavens everywhere.